We are here to improve our patients quality of life through vision. Healthy and clear vision allows us to enjoy many thing we take for granted. Imagine if you could not see your children or grandchildren. What if you were unable to see natures wonders? How difficult would it be to learn new things without the ability to read. Here at North Country Eye Care, we are committed to preserving and improving our patients vision. Regular eye exams will help detect vision and health problems allowing you to enjoy the precious gift of sight for as long as possible. Pediatric exams are looking for vision conditions that may cause difficulty learning as well as decreased vision during their lives. Our vision is developed in early childhood and it is important to allow that development be as good as possible. Children also have the greatest exposure to UV during these years and is the most important time to be protected. Adults exams are generally preventative. We want to make sure our vision is preserved for the future. Patients during these years can be diagnosed with vision problems such as diabetes and dry eye. Most vision problems go undetected because they have little to no symptoms until you have lost vision. Prescribing glasses and contacts is often the reason patients want to be seen, but we are also focused on your eye health. Mature adult exams are needed more frequently and are vital to preserving vision. This is the time when vision problems like glaucoma, macular degeneration, cataracts and diabetic retinopathy usually occur. As we age our vision slowly deteriorates. Elderly patients often associate quality of vision with independence and quality of life. Good vision is important to driving, reading, watching TV and movies, as well as enjoying grandchildren. 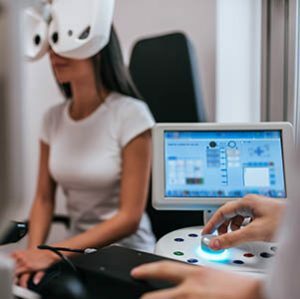 We are here to detect, monitor and treat these conditions to allow for our patients to enjoy vision as long as possible during their golden years. Our optical shop may be new, however, our opticians have many years of experience in helping patients choose the right lens designs and providing accurate measurements. If you have a complex prescription or difficulties getting prescriptions that work for you, give us a chance to use our expertise to provide the best solutions for even the most difficult cases. 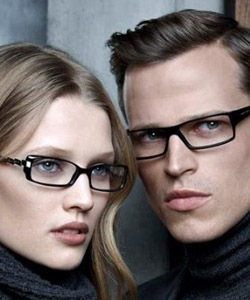 We also realize that fashion is a big component of how well you enjoy your new eyewear and our opticians are trained to help choose the most flattering glasses for your facial shape and style. Check out our new eyeglass cleaner refill station. Stop by the office with your cleaning bottle from North Country Eye Care and get free refills on eyeglass cleaner. Proper care of your eyewear will help prevent scratches and damage. You may notice during your next eye exam in our office, a new instrument that allows us to image a wide view of your retina. This diagnostic instrument makes it easier to detect and diagnose many eye health issues. In the past we had to refer to the doctors drawing of the retina, now we have a high-resolution image on record to refer back to. Patients that are curious can see for themselves a high-resolution image of the back of their eyes. Our Doctors recommend you have this imaging done at least every other year. We are able to look up your out of network benefits for most vision plans such as VSP, EyeMed, Blue View Vision and Davis Vision. North Country Eye Care also gives 10% off to patients using their out of network benefits and we submit the claim for you. Learn more about what problems can be spotted with an eye exam, what’s involved in a comprehensive exam, & special considerations for kids. Dry eye syndrome (DES) is a chronic condition that develops when your eyes don't produce & maintain enough tears to keep the eye’s surface lubricated. Utilizing cutting edge technology, we are diagnosing and managing, with greater precision, diseases like Glaucoma, Macular Degeneration & Cataracts. We use the most up-to-date technology to ensure the best eye care possible. The different types of tests and equipment you may experience on a visit to our Practice. Did you know your optometrist can help you with red eyes, pink eye, or sore eyes, foreign body removal & eye emergencies? Our eye doctors have the latest technology and experience with eye infections, something stuck in your eye, painful eyes & other types of infections.